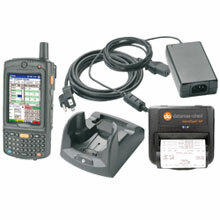 BCI Sales Rep In-a-Box Direct Store Delivery - Route Sales - Sales Rep In-a-Box, Direct Store Delivery - Route Sales, Includes: Motorola MC75 Mobile Computer, Datamax-O'Neil MF4te Mobile Printer, and MiTEzSalesMobile Software. Sales Rep In-a-Box, Direct Store Delivery Pre-Sales allows field sales reps to quickly create and submit orders while at a customer's location to enable immediate fulfillment of their products. This bundle featuring MiTEzSales Mobile enables users to take unlimited regular & future orders, view previous customer sales history and average sales by product, maintain date sensitive pricing and promotions, monitor quality control and product freshness, create work orders for product displays, and track customer inventory by multiple in-store locations to assist with optimal restocking levels. This real-time application is designed to allow remote sales reps to place orders while utilizing industry best practices to automate the sales process providing an intuitive user interface and workflow. The BCI IB-SLPDS-A0E1-1U is also known as IB-SLPDS-A0E1-1U	or IBSLPDSA0E11U	.